So the athletics have gone, taking the most corrupt sport on the planet with them. But when, seriously, will have their circus of cheating and drug taking at the London Stadium again? I suppose I should not be this graceless, grudging and downright unpleasant about athletics, there are many really honest and genuine people involved. But I wonder how many more West Ham fans think just like me about the way our great club is treated in all this? It has come to the point that I am so bitter and twisted about us being blamed for everything as well as the usage of the stadium we are trying desperately to call our home, that I can barely watch athletics on TV when the London Stadium is involved. It’s a question of hypocrisy and morality really, and I will try to explain that a bit later. First of all, we need to watch with interest just how quickly our landlords are able to convert the stadium back into football mode so we can actually start our season properly. We have frequently been told three weeks at a cost of £9million to re-instate the ’removable seating’--I will never call it retractable because it so clearly is not--and the replacing of all our branding and in particular our name across the front of the stadium. If the transformation came be done quicker and cheaper, and there are suggestions that is possible, then it will set a yardstick for the future. And make life easier for everyone. We are continually told that from now on---because the world championships were already in the calendar when we started negotiations for our move from Green Street--our fixtures will always have priority. Lady Five Jobs (I know, I said four last time out, but forgot the Sun, silly me!) is always being quoted as saying just that. But frankly I do not believe that a stadium owned, in effect, by the Government and losing shed loads of cash, would not find a way round all that if a major athletics event was available any summer soon. I feel a touch sorry for Lady Karren over those quotes, because they were made when our club was being told that is what would happen, and they were first issued before a spade had dug into Stratford’s mud. 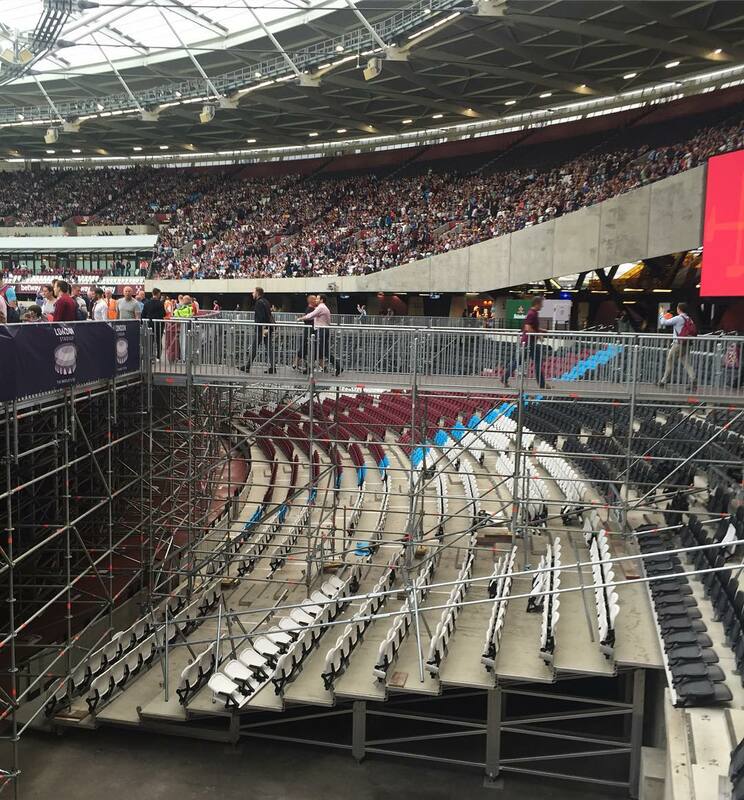 They were made before the supposed retractable seating became a myth when the company installing them went bust. From then on our landlords went for the cheapest and quickest option and saddled us all with the ridiculous situation we have now. Those seats were supposed to roll in and out at a click of a button, just like they do in in Paris at the Stade de France, where it takes just 80 hours and 40 staff to shift the seats back into place, not three frigging weeks! So now the goalposts have been moved, if not the seats, and the club were pretty much stitched up over the issue by their prospective landlords, just like us, the fans, who have now had to get used to scaffolding, plastic covering etc. It was not what we were all promised. I frankly don’t care what is written into a contract (they never count in football so why should they in the outside world), and what we have been promised and what our club is promising us, I don’t believe any of it. London is already planning to bid for the 2022 European Championships, traditionally always held in the first three weeks of August. They are also being prompted by UK Athletics chief Ed Warner, to bid for the Commonwealth Games in the same year. I will be interested to see what Birmingham and Liverpool think of that, both cities are also going for those games. The problem is always going to be the dates in close proximity to the start of the Premier League season. For the last 10 years that date has been between August 8 and 17. Pretty much set in stone. The athletics calendar has the same sort of predictability. When top events come to the UK they tend to be in the last week of July and the first two in August. The 2002 Manchester Commonwealth Games was between July 25 and August 4. These sort of dates do not change much, there is a worldwide calendar. Like in football. You can predict very closely the same international breaks, Champions League and Europa League dates year on year. You can set your holidays by them. Me and the missus always have a nice break in the Canaries every November, and I don’t miss a West Ham game! Next summer the Anniversary Games, a tarted up Diamond League event, will be held at the LS on July 27-28. What on earth happens if we are in Europe (now stop giggling at the back) and have to play qualifying rounds? As for the major athletics events, we won’t be bothered by them again until 2022. The Olympics are going to Tokyo, Paris and Los Angeles before bidding for 2032 starts, and the UK surely won’t get them again so quickly. The World Championships are staged every two years and already fixed for Doha, Oregon and probably Budapest before a possible chance for London in 2023. The Europeans are in Berlin/Glasgow, don’t ask me how, in 2018, Paris in 2020 before the potential of bids for 2022. But you can rest assured there will always be an event in London during July/August each year, the owners just have to make the money. So, I ask our board again, how do you veto such stuff, when the dates are so close to our season? Our landlords, Newham Council, the LLDC and GLC, need to grab the money. Say what they like, it doesn’t ring true. So can I ask the club to make an official statement that we will never again face a season opening like this, three league games away and having to give up home advantage for the League Cup against Cheltenham now on August 23, plus a six-figure sum in compensation? Can our club re-assure us all about that? I doubt it, because if it take three weeks in July and August to shift the seats back it will always, always be a problem for us and the Premier League. And that would not have been the case if the proper retractable seating had been installed. And what really gets me is the way we are treated, air brushed out of existence, our name taken down to suit advertisers and the athletics hierarchy as if we are infringing on THEIR stadium, that we are treated like squatters to be shunted into the shadows whenever the mighty athletics wants. They should remember that without us and our money the LS would have been mothballed or pulled down a long while ago, the Government could not have coped with the crushing maintenance costs. And we have to take this rubbish from athletics, a sport so riddled with drug taking, cheating, state sponsored doping, that it’s hard to believe anything you see with your bare eyes. Their attitude to the booing of two-times drug cheat Justin Gatlin is that it is not fair on him when so many others have done the same thing. And this is the moral compass of a sport who worked so hard to keep football out of the stadium. With the corruption rife in their sport, the had the nerve to take the high moral ground against that nasty, obscene money in football that produced super rich young men and all that roasting, boozing, flash cars and mock Tudor mansions. Yes, that stance is my real beef here. I recall a little story I have had at the back of my mind for some while that underlines just why I dislike the attitude of athletics, that has led us to this state of a bodged-up Lego stadium. Way back when the London Olympics bid had been won, Lord Coe staged a press conference for a few broadsheet writers, the serious end of the market so to speak. Nothing had been built then, and Coe was asked whether London would follow Manchester’s example and have a Premier League club on board from the off. With the stadium built to make it easily converted for football when the runners and jumped had gone home. That was the template that clearly worked. I was told by an old friend who was in on that meeting that Coe got exasperated by the line of questioning and eventually banged the table and declared that football would never be played in this new vision of an athletics stadium. That attitude of disapproval of football’s vast wealth is why we are where we are now. With a stadium that looks great on TV for athletics, but just all wrong with a football pitch in the middle. The attitude then was wrong for the athletics elite backed by the Government, and it was wrong from the moment those retractable seats became a real issue that will dog this club for many years. So I want the club to prove to me and the rest of us that they do have cast-iron control over what happens inside the stadium, for decades to come, when events are staged and more importantly, when they will not. I will not be holding my breath, though.